A program is a course of study with a shared GPA and transcript. In Populi, programs serve primarily to organize courses and degrees into distinct tracks of study which may have unique units, grade scales, honors, standings, tuition schedules, and so on. When you associate students with a particular program (or programs), you circumscribe their course of study to include only those courses and degrees encompassed by their program. Courses and degrees can be associated with more than one program. Say you include BIO455 in both the Science program and the Nursing program. The Science program uses Credits; the Nursing program, Hours. BIO455 is worth three credits and/or four hours. A Science student takes BIO455 receives three credits toward his B.S. A Nursing student takes it and receives four hours toward her R.N. A student enrolled in both programs takes BIO455; initially it maps to Science, giving her three credits. Later on, you decide to map it to Nursing, therefore giving her four hours (in addition to her three Science credits). When setting up your programs, ask yourself: "Do all of our degrees have the same GPA? Or does each degree merit its own transcript with a unique GPA?" Remember, each program gets a separate transcript, grade scale (and therefore GPA), standings, honors, etc. Degree level is a good indicator as to whether you need more than one program—if you offer Undergraduate, Master's, and Doctoral degrees, you should probably have three separate programs for each level. School A offers a Bachelor's Degree, Associate's Degree, and a Certificate. All degrees count toward the same GPA; students that pursue multiple degrees (they earn a Certificate and then pursue an Associate's) with multiple degrees listed on the same transcript. This requires only one program; all students, degrees, and courses will be associated with it. School C offers a Pharmacy Technician Certificate, EKG Technician Certificate, and a Practical Nursing Degree. Each degree is a completely separate course of study—the two Certificates are credits-based, while the Degree is granted based on clinical hours earned. Thus, this school requires three separate programs, one for each degree. Go to Academics > Programs. Give the program a name. Select what kind of units this program will use: Credits or Hours. Select the program's level: Graduate or Undergraduate. Once you add the program, you cannot change the level, so make sure you get this right! Click Save to create the program. If this is a continuous enrollment program and you need to set up payment periods for financial aid SAP purposes, please see this article. Give the standing a name (e.g. 1st Year Masters, RN 2nd Year, Sophomore, etc.). Select a traditional standing under Report As. When including these standings in reports, they may need to be classified under one of these standard reporting categories. If this program has more than one standing, enter the minimum credits necessary for a student to attain this standing. Check to create a Parent of... System Tag for this standing; this will create, for example, Parent of RN 2nd Year system tags for people listed as parents of your students with that standing. Click Add a standing to repeat the process for additional program standings. Click Save to update your standings. Select the year or term for which you want to define the standings. Follow the instructions for adding standings, above. Select a year or term. Click Edit (or click to delete it). Choose a year or term, and then follow the instructions for adding standings, above. The program page lets you view, add, and update the program's basic requirements. Initially, programs inherit these requirements your global Academic Settings. All things considered, you will seldom need to change program details. A little work here usually paves the way for your programs to function for years on end. The full-time threshold is the minimum number of units in which a student must be enrolled to be counted as full-time. This threshold can be inherited from your main academic settings or specifically defined for this program here. If you'd like to change the Default or other existing threshold, click Edit and enter the minimum units (up to two decimal places). Or, if you'd rather add a new threshold, click Add. Enter a date. You can enter any date you wish, though it's probably best to choose the first day of the academic year. This threshold will be in effect from the date you specify until the next time you re-define the threshold. Read about defining grade scales and attendance settings in Academic Settings. You can re-define grade scales or attendance settings for particular years and terms. Just click Add to define it for a new year or Edit to make changes to a year you've already defined. 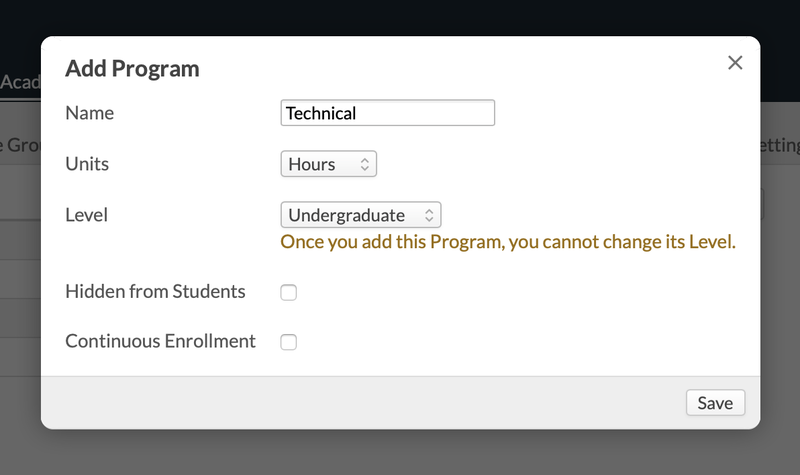 The information panel shows the basic details you entered when you created the program and the default tuition schedule. Click edit to modify any of this information. As noted above, you cannot change the program's level. If you add a default tuition schedule, students enrolled in this program will automatically be given this tuition schedule. Make default program: You must have one program active at all times. Click Make Default program to ensure that you cannot delete or retire this particular program. Retire program: Retiring a program lets you retain it for your historic academic records while preventing new students from being attached to it (students currently in the program will not be affected). Click Retire program to make this happen. Delete program: Deleting a program expunges it from all of your academic records. This is the nuclear option. Click next to the doomed program in the main programs list.